I stumble on things I love or inspire me all the time. I've decided that instead of keeping them to myself I'm going to start sharing them via Favorite Find Fridays! 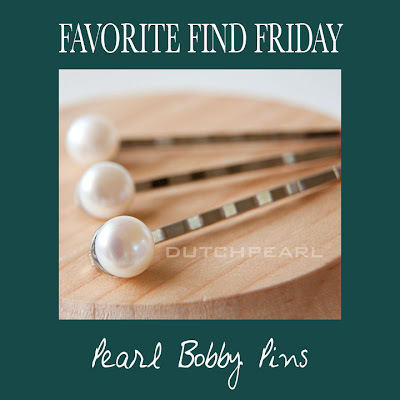 So for the first installment I'll introduce you to... Pearl Bobby Pins. For those of you who don't know me I have this crazy, curly hair. So there isn't a day that i don't have numerous bobby pins to hold it back. I have been know to rescue many a girl from their unruly hair by pulling out one of my bobby pins out during a photo shoot. So when I stumbled on these pearl bobby pins on Etsy I thought what a fun way to add a little flair to my daily hair do.